Well, I’m tired and it is my turn for the shower.� Enjoy your evening and God bless. I make pear sauce (like apples sauce) and then I also can mine in a light syrup. But I do have a wonderful pear cake that I make using the canned pears (the syrup ones) if you would like it. 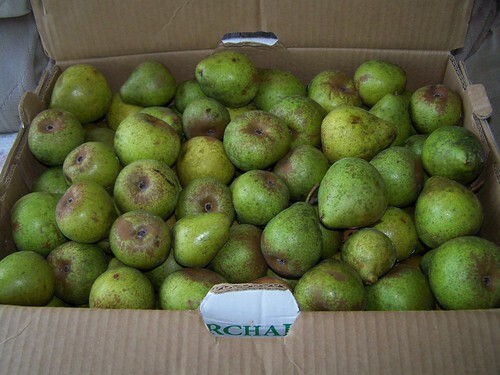 We think it is very delicious and so moist 🙂 If so let me know and I’ll email it to you 🙂 I also make cobblers and things out of my can pears. As for your chickens I do not think that would matter about the crumbles and things. I bet they will pick up laying more in a few days. Sometimes they do not lay everyday. You might could get them some oyster shells )from the feed store) and toss them some of that. It has alot of calcium in it. It also might be getting darker there now and that will start to affect how they lay before long. But all in all I’m sure they are just fine and they’ll lay more in a few days. Those pears look really good! Ours are almost gone. I know if we don’t give our chickens layer feed they won’t lay. I also read online that you can dilute their layer with scraps and they won’t lay as well. I still feed ours scraps though! Oh yeah, we have gotten 6 duck eggs. Bernard and Caspian shared them because I didn’t know how old they were. Quentin is going to make a door in their house so I can check for eggs every day. I so want to eat a fresh duck egg 🙂 Our Barred Rock also layed an egg yesterday. Wow! You would be a handy lady to have around. It is nice you can help your hubby. We love pears. I like mine in salads. In answer to your question, yes Morgan is our daughter. She is the oldest. Good Morning, Donna. … your pears look great.. I think canning them is the best although I have made a ginger and pear chutney before that is very good.. I do not know any thing about chicks… sorry.. It is normal for the chickens to go in cycles like that. We feed ours layer pellets, oyster shell, home ground feed, and scraps. We have made pear sauce, pear butter, and just canned the pears. I bet the pear juice would be really good. Have a great day with your family. Those pears look fabulous! I wish I could bite into one.